GatorCountry brings you a new podcast as we talk about the Florida Gators bowl match-up, plus we talk recruiting. Andrew Spivey and Nick de la Torre breakdown the Gators bowl match-up against Michigan and talk about the importance of the Peach Bowl. 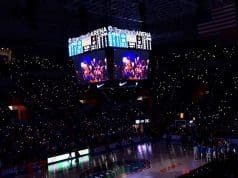 Andrew and Nick also breakdown how the official visit weekend went for the Gators and how recruiting is shaping up for Florida in 2019. Andrew:​What’s up, Gator Country? Your man, Andrew Spivey, here with Nicholas de la Torre. Nicholas, Gators are Peach Bowl bound in Hotlanta. Not a better city. Nick:​I can think of a couple better cities. Nick:​Many better cities, with better baseball teams, in fact. Andrew:​Okay. Well, this isn’t a baseball podcast. We’ll have us a baseball podcast here. Gators get Michigan. It kind of started to look like that was going to be the case after Ohio State beat Michigan, that that’s kind of how it was going to shake out, that Florida was going to get Michigan in Atlanta. People are upset not getting UCF, but Peach Bowl wasn’t going to take UCF two years in a row. I think it made sense. Listen, I think it’s a better matchup. I know people don’t like that, but I think it’s a better matchup. Nick:​I would have liked to see the UCF matchup. Andrew:​Even with McKenzie Milton out? Does it do anything for the argument now? Nick:​No. I think that would have been used as an excuse. I mean, that is what it is. Florida can’t change that. Just like UCF can’t change their schedule. People pointed to Florida’s schedule this year and said, they played two FCS teams. Well, Idaho was an FBS team when Florida had them scheduled in to 2014. That game gets rained out, and you have to make it up. Now they’re not an FBS team. You can’t help who you play. When you’re a team like UCF that’s had the kind of success that they have, the Alabamas and the LSUs aren’t trying to sign up to play those guys. Florida’s not trying to sign up to play UCF. You’re going to pay UCF to come and play? You can play somebody else. ​UCF’s schedule is what it is. They’ve won 25 in a row. The easy thing is to say, who are they playing? They would have four losses in the SEC East. Maybe. We don’t know. Would UCF have beaten Florida with McKenzie Milton? Maybe. We don’t know. Would UCF fans have said, if they had played Florida and then lost, if McKenzie Milton was playing that wouldn’t have happened? Would that have been the excuse? Absolutely. Andrew:​Right. I mean, I’m one of the ones that says if UCF is playing the SEC they’re not winning 25 straight games. I mean, I think, again, that is easy to say and all that. A couple of the national analysts said Scott Strickland kind of made a point that Florida wouldn’t. First of all, Scott Strickland is not in the committee room when Florida is discussed, and second of all, Scot Strickland is not worried about playing UCF. I think that was dumb. Andrew:​I mean, it just is what it is. UCF couldn’t go to the Peach Bowl two years in a row. Nick:​I don’t know. Our good friend Barrett, who is a friend of the podcast, said that there’s a rule. I haven’t found that, but I would not doubt that he knows what he’s talking about when he says there’s a rule. I mean, obviously, the committee can choose not to follow their own rules. Said there’s basically a rule that they can’t send teams to the same place two years in a row, which means UCF, who won their national championship in the Peach Bowl last year, wasn’t going to go back this year. Nick:​There was a story that I read, and I think they could have done it better. I think UF-UCF, for several reasons, has a bunch of great storylines. Nick:​Instate. Listen, I would have absolutely made fun of the committee for sending two teams an hour and a half away from each other to Glendale to play, but I would have loved going to Glendale. Nick:​But then also, you could have had LSU and Michigan, two of the winningest programs in college football history, play against each other. You know how many times they’ve played against each other? Zero. Andrew:​Really? I was going to say one or two. Nick:​They have never played against each other. You could have had those two teams play against each other for the first time ever and had the battle for Oviedo, Spivey. UF versus UCF, the Battle for Oviedo. Andrew:​Okay. I didn’t like the whole Florida-UCF in Fiesta Bowl. That didn’t make any sense to me. I don’t think people see this, and it’s okay, but for me, Florida beating Michigan would be like icing on the cake for this year, to really say Florida really had a successful year. I mean, get smoked the last two times they’ve played Michigan, to go and beat Michigan this year. Granted, I think Michigan may or may not fully show up to the game, but to go beat Michigan really puts the icing on the cake, and I think sets you up for next year. Nick:​Michigan, one of my favorite players, I wanted the Amazon Prime series they did on Michigan last year. It’s almost like a Hard Knocks where they follow them, but they follow them throughout the whole year. I really like Chase Winovich. He’s a former walk-on, just a hard nose player, has pretty much earned everything he’s gotten. He called it this year the Revenge Tour, because Michigan struggled last year. They wanted to beat Penn State, and they wanted to beat, I think it was Northwestern, beat them. They wanted to beat all of these teams that had beaten them. I think for Florida that was big this year. I mean, really on the Revenge Tour. You knocked off LSU. You knocked off FSU. Missed out on Georgia, but this is another one. Florida is 0-4 against Michigan. This will be the third time the schools have played in four years. That’s more times than Florida’s played Auburn, more times than they’ve played Alabama, or any of the teams from the West not named LSU. Nick:​It’s almost a very familiar opponent, and a team that smacked you last year. Andrew:​Right. That’s why I think that, while people aren’t happy about playing them, I think it’s good. I think it’s something that when you go into this game, and if you can go in and win this game, you kind of set a precedent. This isn’t, not that anybody is thinking this is the old Florida, but if you can win the game, you really put a stamp on the season. For me, you kind of knock off another one of those teams that’s kind of owned you. Nick:​Absolutely. Especially Harbaugh. I don’t think there’s much love lost between Jim Harbaugh and Florida Gator fans. Andrew:​No. Listen, the way the game went last year, after it being hyped up, has such a nasty taste in so many people’s, even the players. C’yontai Lewis, guys that were just pissed off after losing last year, and to go to the Peach Bowl. Listen, the Peach Bowl is no bowl to laugh about. That’s a New Year’s Six bowl. Nick:​New Year’s Six bowl. Great bowl game. Andrew:​I like it. I’m down with it. Nick:​Listen, you went no bowl game a year ago. The Outback Bowl as like the fourth highest ranked SEC team the year before that. Peach Bowl, New Year’s Six bowl, it doesn’t get much better than that. You know what, Spivey? I might cover the game from the press box at Mercedes Benz Stadium in like the eating area, because I’ll have a plate full of Chick-Fil-A tenders and sandwiches. I’m just going to eat the entire game. If the tweets are slow, I’m eating Chick-Fil-A. Andrew:​There you go. Florida was #10 ranked in the Playoff Poll on Sunday, so you got a shot to finish in the top 10. If you don’t win, you don’t. For it to be a bowl game with such meaningless points in the game, it is a meaningful game as well. To finish in the top 10, after what happened last year, is huge. Like I said, to get a win over Michigan, it’s huge. I think a lot of guys understand that. I think that will be a focus for Dan Mullen and his staff. Nick:​Obviously, you want to play for an SEC Championship every year, but having this last week off, the coaching staff was able to go out and recruit and get a couple commits and some flips this weekend. I mean, I really feel like, if you look at rankings, and I know we don’t like to do that here, but I had my dad call me today, and he was up late last night and looking at rankings. He’s asking me, why is Florida ranked below Vanderbilt or Mississippi State, this school, that school? 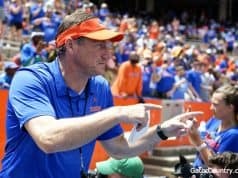 I think really what Mullen’s been saying, there’s a lot of buzz and there’s a lot of excitement about Florida, I think that looks true right now. Andrew:​It does. You’re seeing it, and it’s happening a ton. I know people don’t want to hear it, but it’s happening a ton with the underclassmen in the 2020 and 2021 classes. Listen, is that helping next year on the field? No. Is it going to help in the recruiting rankings this year? No. I get all that. There’s nothing wrong with fans being upset about it, but you also have tounderstand it. You and I say this a lot, it’s a process. It’s a process that this coaching staff is going through. It’s a process that they’re finally getting above, with relationships and that kind of things. The guys they’ve picked up in the 2020 class and the 2021 class are nothing to sneeze about. ​Also, you’re starting to see momentum in the 2019 class. I mean, you had Nay’Quan Wright commit to you over Georgia and Miami. You had the big flip from Miami in Kingsley. I know some people say, well he’s a three-star. Nick, you and I both know that it is so tough to evaluate offensive linemen. I mean, just look at some of the five-stars that’s been on campus at Florida and what they’ve done. Nick:​Jachai Polite was a three-star. Jabari Zuniga was a three-star. Andrew:​I mean, listen, I get it. I get everyone wants to have the stars and all that, and I get that. There’s nothing wrong with that. When you looking at linemen, it’s so tough to tell, because, again, it’s a situation of how many linemen do guys really face that are bigger than them or stronger than them or strong as them? Very little. Nick:​Right. Even something I said about Martez Ivey coming in. I said, they run basically a wing T. He’s never had to really pass block. That’s a whole new thing he’s going to have to start doing. People just see five-star, and they want him to be the starting left tackle as a freshman. I said, it’s a completely different game than what he’s ever been asked to do. Andrew:​Right. Exactly. So, you’re starting to see that momentum, and it’s not only with guys committing now, but it’s guys just taking visits. When you look at, and we’ll get into this more on Friday when we break down the visitors list, but it looks like Florida State offensive line commit Dontae Lucas is going to take a visit to Florida. That’s a huge one for him, just to get him on campus, when a couple months ago, really a month ago, honestly, it didn’t even look like he was going to take a visit. You’re seeing that momentum, slow as it may be, starting to pick up and guys starting to look your way more. You look at the names that are still out there. December 19 is right around the corner, and you got early Signing Day. Think about just what they could pick up. They could easily pick up a guy like Chris Steele. They could easily pick up Keon Zippererfrom Lakeland, Lloyd Summerall from Lakeland. The names that are out there that are uncommitted that Florida could very well pick up are tremendous. Then you have to look at it as a whole. We always say it’s not a sprint, it’s a marathon. December 19, that’s when you can start to judge recruiting classes, and I really think that Florida will be right up there with some of the best. Now, again, I personally, and I’ve said this before, Florida should always be contending for top five, top in the nation classes. It’s the University of Florida. Right now, we have toalso understand where you’re at. I think that Florida competing and being in the top 10 is where they have to be. I think when we look at it, not only December 19, but after February where they’re at, they’re definitely going to be the top 10, or should be. Let me say it like that. Nick:​Should be. Yeah. That’s a big ole boy that’s going to be on campus too. Nothing feels better. You got a flip from Miami, and maybe you’re trying for a potential flip from FSU. Nothing feels better. You take back the state on the field, beating FSU, and you have a chance to really do that when you play Miami to start next year. You start doing that in recruiting? That’s when you start cooking. Andrew:​Yeah. The thing is they’re not done with Miami yet. You very well could, and I’ve been on record as saying that I think Florida will flip the other offensive lineman from Miami in Michael Tarquin. That would mean that you would have flipped Miami’s only two offensive line commits. Nick:​What they got after that? Nick:​You going to commit to Miami? Andrew:​No. Me and Mark Richt together probably wouldn’t be the best of worlds. Nick:​No. I don’t think so. Andrew:​He’d have to pay me a lot of money in order forme to forget, and I don’t even know … Well, I say that. Money can do a lot of things for people. Andrew:​I think I could be Mark’s friend for a couple G’s. Anyway, that’s the case. You look at just overall, when you look at Florida, and let’s just talk about what they’re going to do on Monday. We’re taping this on Monday, so we’re talking about who they’re visiting on Monday. They’re visiting Chris Steele and Kaiir Elam, Matt Elam’s nephew. You look at that. Chris Steele is one of the top 100 guys, I think top 50 guy. One of the top cornerbacks in the country. Florida looks really good for him. Dan Mullen is going out there to see him. Then you look at Elam. Again, a four-star guy, top 100, 150, guy. Florida and Georgia are battling there for him. You look at those two guys in particular, what would they do to the recruiting class? They would jump it a ton. You look at what we just said with Zipperer and Lloyd Summerall. It would jump it a ton. Things are slowly getting there, and it’s a process. I know it’s not as fast as everyone wants it to be, but it’s slowly getting there. The good news for Florida is after the season you’re seeing those guys like Dontae Lucas, Evan Neal, the big offensive lineman, one of the top offensive linemen in the country, Trey Sanders. Those guys are all now wanting to take visits. Now, whether they get them or not is another story, but just to have picked up enough momentum to get Dontae Lucas and Evan Neal on campus, to me, speaks volumes of what they success on the field is doing.Again, one year’s success will only do so much. You got to continue to do it. But just to have those guys come on campus and give you a shot, that’s all you can ask for. Nick:​You always say, follow visits, not tweets. Andrew:​The saying always is, if they visit you, you got a shot. That’s all you can do. The thing is a couple months ago these guys wasn’t even thinking about visiting. Dontae Lucas wasn’t even thinking about visiting. Evan Neal wasn’t even thinking about visiting. Now they’re going to visit and give you a shot. What you do with that shot once they get on campus is up to you. Again, I think that you’re seeing things turn, and turn in a good way. Again, we’ll see what happens on December 19, when a lot of these guys sign early. Then we’ll see what happens on Signing Day. ​I feel like you go into the bowl game, and you go into the off season, feeling good about what you’ve done on the field and what you’ve done off the field. You just have to close a little bit, and then, again, you have to be able to continue success next year. You can’t go out next year and lay an egg and go back to not going to a bowl game, and then expect things to get good. Nick:​Putting you on the spot a little bit real quick. Nick:​At the early signing period, which is in just under three weeks now, what number would you expect Florida to be at? Andrew:​I’m going to be honest. I don’t even know where they’re at right now. Nick:​I think right now they’ve got like 19 spots open. Andrew:​You’re talking about how many sign early? Nick:​How many sign early. Yeah. That’s what I meant. Andrew:​Let’s see here. I believe most of the commits will. Actually, I believe all the commits will. Tyron Hopper is the one that was kind of up in the air of whether he’s going to sign early or not. I believe all the commits will sign early, for the most part, unless some of them are asked, don’t sign early. You could kind of read between the lines of what would happen there, if they didn’t. I would say they probably have 18 or so in the class, I would say would probably be about where I would say, 18 or 19 guys in the class after early Signing Day. Nick:​That’s really kind of most of your class. Andrew:​Yeah. I mean, you’re thinking you’ll take 25 max.So, you have six or seven spots left. I would say anywhere from 17-19 would sign early. Nick:​Okay. Then there’s a reshuffling after that that every school will do. Andrew:​I mean, you get guys from every school that maybe are committed to that school and don’t sign early that you think we don’t have a shot with them. Well, if they didn’t sign early, yeah, you do have a shot with him, because now there’s a reason they didn’t sign early. So, what’s that reason? Is it that school may not have room for that person, or is it that guy just isn’t as solid as people thought he was? You kind of have a reshuffle on that spot. Let’s just say, and, again, I think this guy is going to Florida, but let’s just say Keon Zipperer decides to go to Miami. Florida really needs a tight end in this class. So, if Keon Zipperer was to go to Miami, you have to reshuffle and say, okay, we got to go find a tight end in this class. Who did not sign on Early Signing Day that could potentially be a Gator and be good enough to play in the SEC at that position? Now, I’m just using that. I think Keon Zipperer, he’s definitely leaning toward Florida, and I like Florida’s chances with him. I’m just using that for an example of what would happen if a guy at a position of need went elsewhere. Nick:​That’s a great point. Because who then are you reaching out to even? You got to figure out who signed, who’s still available? Where are they? Have we had any contact with them? What’s their interest level? Is it someone where is the Florida brand back enough where just us coming back in, being Florida, will that do it? It hasn’t really done it in the past, in the recent history at least. Nick:​Am I just signing somebody because we needed a tight end, and he plays tight end? Andrew:​Right. Exactly. That’s what you can’t do. I would say so far in this recruiting class they haven’t done that. It’s been a situation where they’ve gotten commitments from, I would say, just about everyone that I think are SEC quality players. But yeah, it is that. Someone said it last year, and I forgot who said it. It might have been our good friend, Chad Wilson, Quincy and Marco’s father, who said, the early Signing Day also lets some guys that are maybe hidden gems be found, because those guys who you maybe are overlooking, because you’re trying for that big five-star, you’re not thinking about him. This case, like I said, if you need a position of need, you maybe go and start to dig up film and find guys that are maybe we just overlooked this guy, because we thought we had John Doe at Lakeland. Nick:​That’s a great point. Are you taking just a warm body, or is it somebody who maybe you just overlooked him? Andrew:​Right. Exactly. You look at it, especially on the offensive line, Nick. 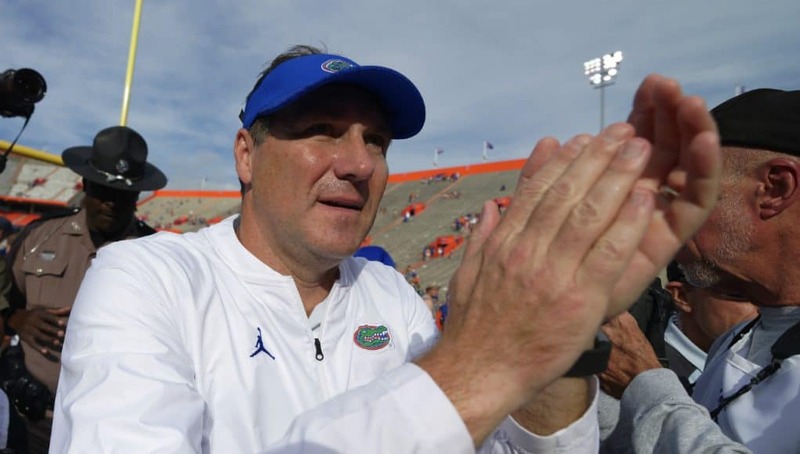 I believe Florida will be just fine on the offensive line in this recruiting class, and it will be a situation where I think that they reach their number, and they reach their number with really quality players. I don’t think, like last year where they had to maybe start digging for some guys, I don’t think that that’s going to be the case this year. I think that they’re going to be just fine, and they’re going to go out and sign those guys. If it was a situation where maybe they didn’t get an offensive lineman they need, then that’s where they go out and look, because they got to have tackles in the class. They would have to go out and look there. That’s when you start to even look at some of the JUCO guys, JUCO guys that didn’t sign. You say, maybe that, or you start looking at some of the transfers. Nick:​I mean, Florida’s not in a position right now to take 25. We’ll go over that as guys start to transfer and declare for the Draft, stuff like that. They could get to 25. Andrew:​I believe they will, between guys leaving early and guys just simply not fitting into Dan Mullen’s program. Listen, it’s going to happen. Go ahead and mark it down. It’s going to happen. Guys took this year to see, do I fit in with what Mullen is trying to do on offense or defense? After this year, if they said, maybe I don’t, they leave. Nothing wrong with that. It happens at every program across the country with a new coach. Andrew:​Again, Nick, it’s a big week. Florida is out on the recruiting trail this week. Some people ask, how do they do that with bowl game practice? Bowl game practices really don’t start till next week, and it really don’t even ramp up until the later part of next week. There’s only 14 practices. The game is on the 29th, so they kind of catch a break. All schools kind of do that are playing the New Year’s bowl. They don’t have to split time. They’re able to really go out and spend all week doing this, and then they have official visitors next weekend as well. It’ll be a thing where it will be almost where recruiting is over with before they have to worry about bowl practices and getting the team prepared for that. Nick:​Yeah. That’s a nice little benefit. It’s a New Year’s Six bowl, but it’s not on New Year’s Day. It’s the 29th. Alabama and Notre Dame and the teams in the playoff, they get like a month before they play. Andrew:​No. It’s the 28th, right? Andrew:​Or the 27th. Yeah. It’s before. I believe they play before Florida, the semi-final game. Nick:​Cotton Bowl. Yeah. What do I know? Andrew:​What is it? 28th, right? Nick:​It’s the same day. 29th. Andrew:​29th. Okay. It used to be that case, where the BCS Championship game was, what, January 13th? Nick:​Yeah. Both teams play the 29th. 4:00 is Notre Dame and Alabama. Oklahoma is at 8:00pm on the 29th. Andrew:​So, they’re actually in the same position Florida is, with having to go out and recruit and then worry about bowl prep as well. Of course, their bowl game is a lot more important in the playoff, but again, you can only have so many practices. Nick:​You can only have so many practices. You have to use those the right way. Then those practices are interesting. Dan Mullen, we spoke with him on Monday on the Peach Bowl. I’m looking up Cotton Bowl and Orange Bowl stuff, and I almost said we spoke to him on the Orange Bowl. Spoke to him on the Peach Bowl teleconference today, and he said he’s talked with all of the Draft eligible guys. They’ve gone through, and they’ve asked them, you want us to send in your Draft paperwork to see what scouts and NFL teams think of you, where they think you could go? If you need to do that, we need to take care of that quickly. But he’s also said that most of his players, most of those guys, have indicated that they will play in the bowl game. If there’s an instance where you say like Jachai Polite decides he’s leaving, and he’s not going to play in the bowl game. Well, he’s not practicing. We need to get somebody else ready. We also need to use these bowl practices to get guys like, for instance, Zach Carter, guys that are freshmen that haven’t played a bunch, get them time. Richard Gouraige, get him playing time against some of the first team, some of the second team. Yes, you’re still preparing for Michigan, but you’re also trying to get these guys, what do we have for the future? Andrew:​That’s exactly it. Again, I think, like you said, I think all of Florida’s guys will play in the bowl game. Chauncey Gardner, in his tweet or message, whatever you want to say, when he announced he was leaving, said he was planning on playing in the bowl game. So far, all the guys that I’ve heard that could possibly make the jump to the League have said they’re going to play. One note is Rashan Gary is out for Michigan’s game. Andrew:​Should have been, but Florida never went after him. Andrew:​Randy Shannon said that he was not an SEC linebacker. Nick:​Yeah. He looks like an NFL linebacker. Florida never went after him. Devin Bush is one of the best linebackers in the country. Andrew:​Shoot, he’s one of the best players in the country. Nick:​Regardless of position. Stud. Love watching him play. He hasn’t committed either way. I don’t want to say he’s noncommittal to playing. He just says he needs to talk to his family still, and he needs to talk to the coaching staff. Andrew:​Right. Go ahead and make that business decision not to play, big guy. Andrew:​I was about to say. Nick:​They were #2 heading into the Ohio State game. Then they gave up 600 yards and 69 points. Let me pull that up realquick. What is their total defense? Nick:​Oh, Michigan is ranked #1 in total defense. That’s just in terms of yards. Scoring defense, that probably took a hit. Yeah. That took a hit. Where did they drop down? They dropped down from 2 to 12. Nick:​That’s what happens when you give up 69 points. The #1 total defense, and a top 12 scoring defense, potentially playing without their two best players. Then you look at the rushing defense, Michigan is 17th in the country, but you’re looking at your leading tackler and your leading tackle for loss guy not playing. Andrew:​Yeah. The thing Florida goes into that game is they’re going to face a good defense, but an offense that’s been shaky. You think about Florida’s defense, who I think has at times been bad, and then at times been pretty good. It’s a defense that should be okay against Michigan’s offense, unlike last year, but we’ll get into more breaking down the game a little bit more. Again, I don’t think that any of Florida’s guys are planning to bounce early, or leave the bowl game early. I think several guys, including Chauncey, who’s already done, have said or have let people know that they’re most likely going to go. ​One guy though, Nick, that I want to say, I don’t know why these rumors keep coming up and people saying this, but people are asking me. Andrew:​Next December. I expect Lamical Perine to be in a Gator jersey for the 2019 football season. Andrew:​Yeah. Let’s go through that real quick, Nick. We’re bouncing around all up on the podcast, but little free for all here. Which guys do you expect to go, and which guys do you expect to stay? I guess, who would surprise you? Nick:​I would expect Jachai Polite. I would expect, I right now would expect Jawaan Taylor. I would be more surprised if Jawaan Taylor stayed for his senior season than if left and forewent his senior season. I don’t think he should leave, but I don’t think he’s going to stay. Andrew:​Yes. I think the ones that to me that I’m thinking leave are Jachai. Andrew:​Jordan Scarlett. Jawaan Taylor. I think Jabari is 50/50. Nick:​That’s one that I really think is really a coin flip, a coin toss in my mind right now. Andrew:​Okay. Yeah. I just think it’s up in the air on him. I think that he’s bouncing back and forth, from everything I’ve heard. I’m going to ask you this, and you and I had this discussion a little bit over the phone off the air here a little bit. My thing is this. I’m going to ask you, and then we’ll have people follow up on the message boards and on Twitter and all that good stuff. Do you want to be the guy on the defensive line next year, in Jabari, who’s going to get double-teamed some as well, or do you kind of go to the League and be a second or third-rounder for what happened this year? Nick:​That’s tough. I probably go this year. Listen, he, along with Jachai, maybe even more so than Jachai, who has better numbers, is going to jump off the charts at the Combine, which he would be invited to. He’s a guy that will run fast. He’ll bench press it all. He’s a guy, to me, that would see his stock raise. He’s a very good, well-spoken person. Little soft spoken, but well-spoken, and he’ll do well in interviews. Never had a problem off the field. Stand up guy off the field. To me, he would only see his Draft stock rise throughout that whole process of crazy questions and interviews and workouts. Andrew:​Yeah. I agree with you for the most part there, but also, I mean, I’m just going through here and thinking, a guy like Jon Jon Bullard, and I know he dropped a little bit in the Draft and all that stuff, but what he could have done had he left early compared to how he finished his senior, I think is kind of what I think Jabari could do as well, really rise up. Like you said, I do think that overall, whenever he comes out, he’s going to do really well. He’s going to test really well at the Combine, but how far can he jump his stock on film and on the field by just coming back this year is what I think probably is going through his mind right now. I can’t say I disagree with him, because if he comes back next year and he’s the guy, and he really has a good year, you could be a looking at a first-round talent. Jabari has got first-round talent in him. He just hasn’t showed it completely. I think he’s been overshadowed a lot as well. Nick:​I agree. I also agree with your point that you look at what happened next year. Am I going to get double-teamed? Am I not going to have the same opportunities? Then there’s the chance for injury. Andrew:​There’s a lot that goes through your mind. There’s no guarantee that you have the year you do next year. You could come back next year and do nothing and drop down the board. Now, I don’t think that happens with Jabari, but, again, I think it definitely could weigh into it and see how that goes. ​Another one I wanted to go to, Nick, and talk about, Jordan Scarlett. I think that he is one that is probably weighing his options more so than he thought he would probably weigh his options heading into the year. I think that he makes the best decision and goes ahead and goes. Listen, it’s a race to that second contract. Being in college for five years slows that down five years to getting that second contract. Nick:​He’s also a guy with a lot of wear on his tires. He started, really, started at running back at university school when he was in eighth grade? Nick:​He’s already 22 years old, and he’s, I think, a semester away from graduating. If he were to come back next year, he would have to enroll in graduate school and start taking graduate level courses. It’s not like Matt Liner coming back for his senior year and taking ballroom dancing his fall semester. You’re taking graduate level classes while sharing the backfield again with Lamical Perine, a healthy Malik Davis, and a sophomore, why does his name escape me right now? Nick:​Damien Pierce. You’re sharing the backfield with Perine, Pierce, Davis, and then any other freshmen that also come in and try to take reps.
Andrew:​You’re exactly right here, but I think that you have to look at that and see that it’s a situation where it might be best. Again, Jordan Scarlett is a guy that’s going to go tear up the Combine. He’s going to go tear up the Combine. Nick:​He’s going to put up 225 40 times. Andrew:​Yeah. Now, what happens off the field and all that good stuff. Nick:​Lot of questions about that stuff. There’s, obviously, marijuana use, going back to his freshman year, getting cited for that, the credit card stuff. There’s a lot of off the field questions for him that he’ll have to answer. Andrew:​Right. Again, I think that he could be okay. I definitely think that him going ahead and going is probably, I don’t want to say the best thing for him, but I think it’s a situation where I personally am not saying he makes a bad decision by any means if he goes ahead and goes and gets out of that crowded backfield as well. That’s the guys. ​I think I would be shocked if Jachai or Jawaan stayed. Nick:​Yeah. I was trying to figure out if I’d be more surprised if … I’d be more surprised if Jachai stayed than if he left. I’m not sure. I think I’d be more surprised if Jawaan left than he stayed, but not sure. Andrew:​Here’s the thing. And I’m never, ever going to be the person who says, you made a dumb decision going to the League, I will say that I am kind of shocked though, Waany is not wanting to come back and be a left tackle next year. Nick:​I think you need to show that. Andrew:​Again, I’m not one to sit here and say, you’re making a bad decision, I mean, that you shouldn’t. Andrew:​Yeah. Go get paid. You got a family to take care of, everything else. Go get paid. I will say that I was kind of shocked when I heard how much he was leaning there. I was kind of shocked. Andrew:​Again, that’s our opinion. I want to talk real quick, Nick, about the rest of college football over the weekend. What a game in the Mercedes Benz. Andrew:​Best game of the year? Nick:​I don’t know, because we had the seven overtimegame that was incredible the week before, but it’s got to be up there, right? Andrew:​I had the LSU game just right above it, because, I mean, that LSU game, Nick, that was some amazing stuff. Nick:​Yeah. I mean, just to get to overtime. The throw that Kyler Murray made was incredible. Then just back and forth. It was fantastic. Andrew:​I mean, to see that, to see the back and forth, like you said. I mean, it was insane. It was a really good game, and it was something that it was just like punch, counter punch. I mean, the storybook writing of that Alabama-Georgia game. To see Jalen Hurts and to see him come back. Listen, I’m the most anti Alabama guy out there, but to see that and to really see Nick Saban embrace that was awesome. Also, to kind of see a guy get rewarded for staying. I think that we oftentimes in society, now especially, Nick, we run from it. If you’re not starting, you run from it. To see that happen, that’s going to make a lot of guys think twice about leaving now. Nick:​I don’t know if it will make a lot of guys think twice about not leaving. Nick:​No. I think that’s just the culture, the culture of kids today. It’s what’s the benefit of me right now, not what could it benefit me down the line, or is the best decision? It’s what does this do for me today? To see Tua go down, you don’t like to see that, obviously, but to see the way that Jalen responded. Jalen Hurts could have done the same thing Kelly Bryant did and could have left and saved a year of eligibility and took a redshirt this year and then been a grad transfer with two years to play. Instead, he stayed and competed, and he was always one of the first guys to celebrate with Tua when he was doing well. Never put his head down, and you could tell that in the way that he played in the SEC Championship game. Andrew:​Like you said, it’s cool to see. I mean, again, nobody could have imagined that would have happened and none of that stuff. I will say that, as bad as it is, doesn’t look like Tua can stay healthy. Again, he has that running and throwing, just like Tebow did, where he’s going to take a lot of abuse every game. He’s going to a lot, and he didn’t stay healthy. But to see that happen was awesome. ​Let me ask you this, Nick. If you were on the committee, would Georgia have made it? Nick:​No. I think Georgia is a very good team. I think Oklahoma … it doesn’t matter. I think the biggest difference in the argument would be that Oklahoma doesn’t play defense. Their offense is historically good. Andrew:​They have probably the Heisman Trophy winner at quarterback for the second straight year. Nick:​You don’t think Tua gets it? Andrew:​I think the discussion will be there. I think Saturday, where Kyler’s game was on, and it was his game, and there was no other games, I think hurts him, but it will be interesting to see. You and I both know a lot of guys get that ballot, and they vote immediately. They don’t wait till the end. If you waited till the end, I think Kyler gets it. I think Tua deserves it, me personally, because I think he plays a lot better defenses than that. I also can make the argument that Kyler does as well. I mean, my thing with Oklahoma is that offense, their offense versus Alabama offense would be fun. Andrew:​I’m here for it. I wouldn’t put Georgia in either, simply for the fact that I feel like that was a playoff game on Saturday. You lost. Nick:​That was your chance. You were the #4 team. If you beat Alabama, you’re in. Andrew:​I know some people said, nobody else had to play a quarterfinal game. True, but, unfortunately, you do. Also, that 20-point loss to LSU, I’m sorry. It just doesn’t look good. Nick:​No. That’s not a good look at all. Andrew:​To me, that’s what I can’t get over. Is it wrong? Maybe. I can’t get over that. Nick:​I think the biggest thing for me is what you just said, and it was you had a chance. All you do is win. Win, you’re in. Andrew:​Right. Listen, I think that the difference for me is this. I’ll say this, and I’ve said this kind of off and on. If you’re asking me for the best four teams, I think Georgia is one of the best four teams. But that is what the playoffs is about, but not what the playoffs is about, in a way. We haven’t gotten the chance to see. We all know Alabama is the best team. We’ve seen Georgia wasn’t able to beat them. I haven’t seemOklahoma, Notre Dame, or Clemson play them yet. I know what Georgia is, and I know Georgia’s not the best team in the country. So, why put them in the playoff? Andrew:​That’s just my take. Anyway, Nick, tell everybody where they can find us. We’ll get out of here. We’ll see everyone on Friday, as we break down everything happening in recruiting, break down the official visits and all that good jazz. 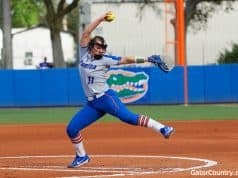 Nick:​www.GatorCountry.com for all your Florida Gator news. The podcast is there in audio and transcript form. You can find the podcast wherever you choose to listen to podcasts. Just search Gator Country and hit that subscribe button to never miss an episode. On your social medias, @GatorCountry on Facebook and Twitter. @TheGatorCountry on Instagram. I’m @NickdelaTorreGC, and he’s @AndrewSpiveyGC. Andrew:​There you go. Keep following us. A lot of basketball this week as well. An important week for Florida. They go play in New York at Madison Square on Tuesday night, so that will be a big one as well, as they look to rebound. Andrew Nembhard, by the way, Freshman of the Week, the SEC point guard is a stud. Nick:​Yeah. Mike White looks like he has a good one there. Andrew:​Yeah. His recruiting class is really good as well. Anyway, as always, guys, check us out. And as always, chomp, chomp and go Braves.